To participate in any personal use fishery, you must be an Alaska Resident, and possess a valid Sport Fishing License or ADF&G senior license or ADF&G Disabled Veteran's License. A permit is required to personal use dipnet for salmon in the Kenai River, Kasilof River, or Fish Creek. Permits can be obtained from private vendors or at Fish and Game offices in Fairbanks, Anchorage, Palmer, Soldotna, and Homer. Permits are also available online through the Alaska Department of Fish and Game Online Store. Households may not have both the Upper Cook Inlet Personal Use Salmon Permit and the Kachemak Bay Coho Salmon Set Gillnet Permit. Households must choose one or the other permit. Personal use permits are household permits. This means that only one permit is required per household. However, all participating members of the household who are 18 years old or older must also have an Alaska resident sport fishing license, ADF&G senior license or ADF&G Disabled Veteran's license to participate, and must be named on the permit. You must record the date, location, and harvest by species each time you fish. You must fill in this information even if you did not catch any fish—write "0" in the space provided for harvest. The salmon must be recorded on the permit before it is concealed from plain view, such as put in a cooler, or before the salmon is transported from the fishing site, such as your vehicle. Failure to record the salmon on the permit is a violation, and may be subject to fines and loss of future personal use fishing privileges. Each household permit is also a harvest recording document. You must return your permit to ADF&G at the end of the fishing season, by the date specified on the permit, even if you did not use the permit, and even if you did use the permit but did not catch anything. Failure to return the permit is a violation of 5 AAC 77.015(c) and may be subject to a $200 fine and loss of your personal use fishing privileges. Personal use salmon required to be "marked"
By regulation, you must "mark" salmon harvested in a personal use fishery in which a permit is required by clipping both tips of the tail fin. Scissors or shears are the best way to cut off the tips of the tail fin. The salmon must be marked before the salmon is concealed from plain view, such as put in a cooler, or before the salmon is transported from the fishing site, such as your vehicle. Failure to mark the salmon is a violation, and may be subject to fines and loss of future personal use fishing privileges. The total yearly harvest out of all the Upper Cook Inlet personal use salmon fisheries (Kenai, Kasilof, and Fish Creek) is 25 salmon and 10 flounder for the permit holder and 10 salmon for each additional household member. 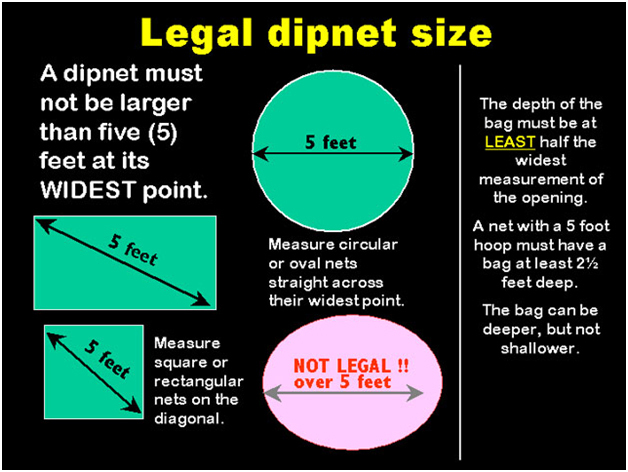 The limit is combined for all four fisheries - Kenai dipnetting, Kasilof dipnetting, Kasilof set gillnetting, and Fish Creek dipnetting. King salmon may not be kept in the Fish Creek dipnet fishery. Only one (1) king salmon 20 inches or greater in length, and no more than 10 king salmon under 20 inches in length may be retained per household from the Kenai River dip net fishery. These are annual household limits, not a daily limit, or a limit per fishery. the frame must be attached to a single rigid handle and be operated by hand. This definition applies statewide, to both salmon and herring/hooligan dipnet fisheries.